The Franklin Institute is the exclusive East Coast destination for "Vatican Splendors," an exhibit opening September 19 exploring the historical and cultural impact of the Vatican over the span of 2000 years. Pictured: "The Holy Family with Two Angels" painting created during the 16th century © Cittá del Vaticano. This week, many events and exhibits that promote peace and preservation in anticipation of the arrival of Pope Francis in Philadelphia. Robin Bloom shares her picks. Philadelphia takes part in the United Nations International Day of Peace with Peace Day Philly, a variety of events related to peace education, global citizenship and awareness, spiritual engagement, social justice, cultural storytelling, and more throughout the city and the surrounding region. Activities now through Monday, September 21 include a peace rally, interfaith peace celebration, skills for peacemaking dialogue, Sing Along for Peace and more as well as Building Bridges of Faith: Photographs of Papal Visits to the Holy Land, archival scenes from recent and historic visits to Israel by Blessed Pope Paul VI, Saint Pope John Paul II, Pope Emeritus Benedict XVI, and Pope Francis, from 1963-2015, on display at the National Liberty Museum, September 19-21, 321 Chestnut Street, Philadelphia. 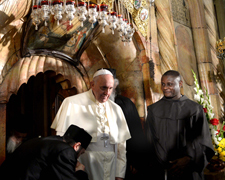 Pictured: Pope Francis in the Church of the Holy Sepulchre (courtesy of the Consulate General of Israel). The Franklin Institute is the exclusive East Coast destination of Vatican Splendors, exploring the historical and cultural impact of the Vatican over the span of 2000 years. Opening September 19, the exhibit features objects straight from the Vatican with many priceless artifacts that have never before been on public view. Items in the nearly 10,000 square-foot exhibition include mosaics, frescoes, paintings by Renaissance masters, works by well-known sculptors, intricately embroidered silk vestments, precious objects from the Papal Mass, uniforms of the Papal Swiss Guard, historical maps, documents and relics. Look for artwork by Michelangelo, including signed documents and a rarely seen bas relief sculpture, and tools used in work on the Sistine Chapel and Basilica of Saint Peter’s. 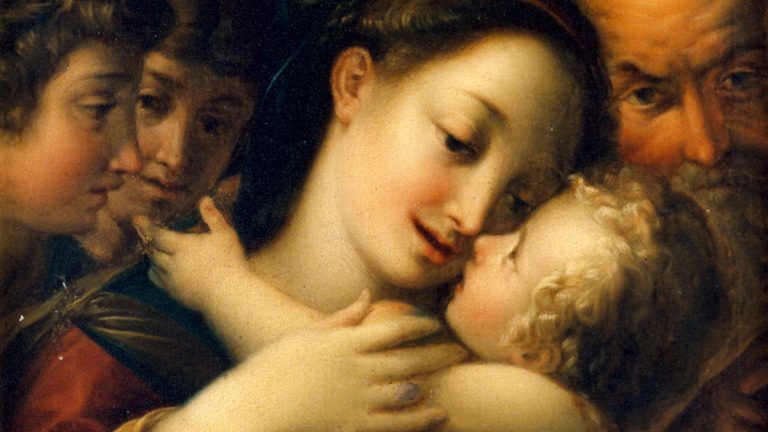 Also, works by masters including Bernini and Guercino, artwork dating back to the first century, venerated remains (bone fragments) of Saints Peter and Paul, relics discovered at the tombs of Saints Peter and Paul, and historical objects from the modern and ancient basilicas of Saint Peter’s in Rome. Organized into 11 galleries that illustrate the evolution of the Church, with thematic areas highlighting important developments, people and events tied to the history of the Vatican, in multi-sensory recreated environments, 222 North 20th Street, Philadelphia. Vatican Splendors is produced by Evergreen Exhibitions and is organized and circulated in conjunction with the Congregazione per l’Evangelizzazione dei Popoli of the Vatican City State with items on loan from The Reverenda Fabbrica of Saint Peter, the Basilica of Saint Paul Outside-the-Walls, the Basilica of Saint Mary Major, the Vatican Library, the Congregation for the Evangelization of Peoples, the Apostolic Floreria, the Papal Swiss Guard, the Vatican Museums, and private collections. The exhibit will not be accessible on September 25, 26, 27, and 28 during the Pope’s visit. 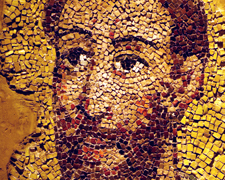 Pictured: Mosaic Saint Paul © Cittá del Vaticano. While there, check out the 100 pound Vatican and surrounding St. Peter’s Square made entirely of LEGOs, created by Father Bob Simon, made to scale, on view in the atrium. Opening this Saturday, September 19 at the Barnes Foundation is Strength and Splendor: Wrought Iron from the Musée Le Secq des Tournelles, Rouen and Ellen Harvey: Metal Painting. Approximately 150 masterworks from the Musée Le Secq des Tournelles, Rouen that range in date from the Middle Ages to the early 20th century join the 887 pieces of European and American wrought iron already displayed throughout the museum. The exhibit offers objects including door knockers, jewelry, plaques, signs, tools and more from the world’s repository in France, the first time exhibited in the United States. Artist Ellen Harvey’s site-specific installation was commissioned by the Barnes Foundation, and consists of more than 800 oil paintings on magnetized panels mounted as a large-scale collage. Both on view through January 4, 2025 Benjamin Franklin Parkway, Philadelphia. 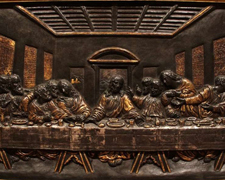 Pictured: A 17th century craftsman recreated The Last Supper by Leonardo da Vinci in iron, burnished and gilded. (Emma Lee/WHYY). Embrace Open Space with Natural Lands Trust’s exhibit highlighting the natural features found in our region’s preserved areas, through September 25 at Montgomery County Community College. Featuring artwork by more than 50 artists (available for purchase) that helps to increase public awareness about the importance of keeping open spaces, and reflects the non-profit conservation organization’s mission “to protect the forests, fields, streams and wetlands that are essential to the sustainability of life in eastern Pennsylvania and southern New Jersey.” Free and open to the public, Fine Arts Gallery, 340 DeKalb Pike, Blue Bell, PA. Free parking. 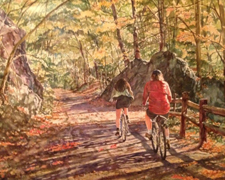 Pictured: Trail Blazing Along the Perkiomen by Lori Quinque-Quinn. The world premiere exhibition Visions of Place: Complex Geographies in Contemporary Israeli Art opens at Rutgers-Camden September 17. Curated by Dr. Martin Rosenberg, Professor of Art History, Rutgers-Camden and Dr. J. Susan Isaacs, Professor of Art History, Towson University, the show features 51 works by 36 Jewish, Arab-Muslim, Arab-Christian, Druze, and female contemporary artists – all Israeli citizens – through December 17, Stedman Gallery, 314 Linden Street, Camden, NJ. Opening reception with curators, September 17, 6:30pm. Free and open to the public. Secure parking in Camden Technology Center Parking Garage, 601 Cooper Street. 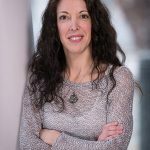 Part of A Moveable Feast of Israeli Arts and Culture, Israel-related programming throughout the Delaware valley that includes a lecture series, musical performances, reading by a contemporary Israeli author, tours, and more. 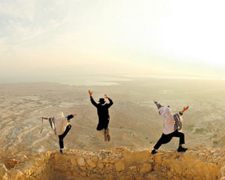 Pictured: Sunrise at Masada, 2008, photo credit courtesy of Toby Cohen. 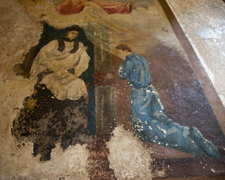 Eastern State Penitentiary illustrates the power of penitence with extended museum hours and special access to the newly restored murals in the Catholic Chaplain’s office, Sunday, September 20 through Thursday, September 24, 10am-8pm. The pieces were painted by inmate Lester Smith in 1955, a self-taught artist who used the signature “Paul Martin” to honor is two favorite saints. Smith converted to Catholicism in prison and Father Edwin Gallagher, Eastern State’s Catholic Chaplin (1952-1958), saw him painting in his cell and invited him to decorate the offices where he met with and counseled inmates. Access to the murals is normally allowed at select times, 2027 Fairmount Avenue, Philadelphia. Eastern State will be closed Saturday and Sunday, September 26-28 during the Pope’s visit. Photo courtesy of Eastern State Penitentiary. 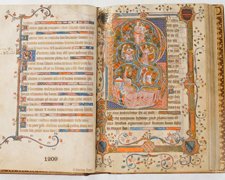 Verbum Domini II: God’s Word Goes Out to the Nations opens Monday, September 21 with more than 80 artifacts from Museum of the Bible’s Green Collection, one of the largest private collections of rare biblical texts and artifacts in the world. Originally exhibited at the Vatican in Rome, the 15,000 square feet exhibit features fragments from the Dead Sea Scrolls, five pages from the Bodmer Psalms Codex, a near-complete copy of the book of Psalms in Greek on papyrus from the third to fourth century CE, pages from the Codex Climaci Rescriptus, which contains Christian texts from the sixth to eighth century, most of them in Aramaic (the language Jesus spoke), the fourteenth century Hours and Psalter of Elizabeth de Bohun, Countess of Northampton, one of the most extensively illuminated manuscripts of its kind, a first edition of the King James Bible, and more on display at the Pennsylvania Convention Center through Sunday, September 26 in Hall G of the Pennsylvania Convention Center, accessible via the Broad Street Atrium. Free and open to the public. Photo courtesy of the Museum of the Bible. Also on display at the Pennsylvania Convention Center is a life-size marble casting of one of Michaelangelo’s Pietá, September 22-25. 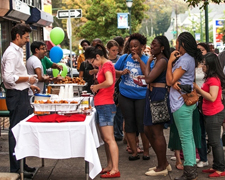 The second Baltimore Avenue Dollar Stroll of the season returns Thursday, September 17, 5:30pm-8:30pm, an outdoor street festival with participating businesses offering $1 specials along with live music, street performances, and more, Baltimore Avenue from 43rd to 51st Streets, University City. Rain or shine. Photo courtesy of University City District. 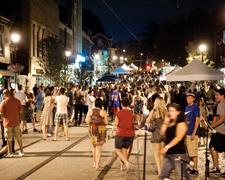 Street Fare: Sip, Savor, Stroll features live music, craft vendors, children’s activities, craft brews, and gourmet offerings from over 50 food trucks and restaurants on Thursday, September 17, 6pm-10:30pm in Mt. Airy. ReLive, Hennessey Bonfire, School of Rock, Bethlehem & Sad Patrick, Philly Bloco and The Band Sheep perform on five stages along Germantown Avenue between Sedgwick and W. Mt. Airy Avenue. Photo courtesy of Go Mt. Airy.Clark Park’s Fall Music and Arts Festival with Rock to the Future is Saturday, September 19, 11am-7pm with vendors, food, children’s activities and live music by the Rock to the Future House Band, Black Landlord, Rosemary Fiki, Rockers Galore, Nik Greeley, Conversations, and more, 43rd and Chester Avenue in West Philly.Brazilian Day Philadelphia is Sunday, September 20, 1pm-7pm, celebrating the culture and traditions of Brazil and its Independence Day with a unique blend of Brazilian Culture showcasing Samba, Forro, Pagode, Capoeira, Samba-Reggae and more, Great Plaza, Penn’s Landing. The Rittenhouse Square Fine Arts Fall Show once again “Circles the Square” September 18-20, featuring a diverse range of art for purchase. 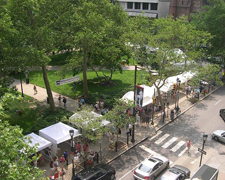 Originating as a “Clothesline Show” in 1932, it is now regarded as one of the most respected and active outdoor art shows in the country, 18th and Walnut Streets, Philadelphia. Hours: Friday, September 18, 11am-7pm, Saturday, September 19, 11am-6pm, and Sunday, September 20, 11am-5pm. Art Walk on Saturday and Sunday. 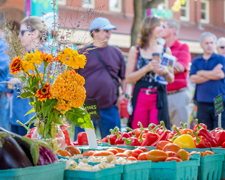 The Pennsylvania Horticultural Society hosts the annual Harvest Fest, taking place in both PHS Pop Up Gardens, 15th and South Streets and 9th and Wharton Streets, September 17-20. Enjoy live music by Pop Ups and The Plants, Sinatra Sunday, seasonal crafts, garden games, harvest competitions, beer gardens and #PopQuizzo, Philadelphia’s first-ever “simulcast” Quizzo battle on 80-inch screens (hosted by Johnny Goodtimes), and more. Quizzo takes place Thursday, September 17 at both gardens beginning at 6pm. Photo courtesy of the Pennsylvania Horticultural Society. 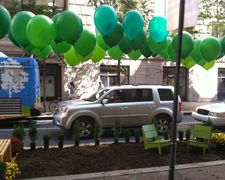 Go green and convert a metered parking space into a temporary park in this year’s Park(ing) Day Philadelphia, Friday, September 18. Philadelphia joins with cities all over the world in an effort to raise awareness for the need for more green and pedestrian-friendly urban open spaces. See over 50 interactive parks on the city streets from approximately 8am-5pm. Visit the website to sign up for your own parking space and for a printable Google map. A reception follows at the Philadelphia Center for Architecture from 5:30pm-8pm with food, drinks, music, and a talk on Tactical Urbanism by Mike Lydon. Photo courtesy of Park(ing) Day Philadelphia. 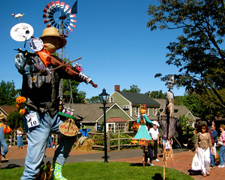 Celebrate Fall’s arrival with the annual Scarecrow Festival at Peddler’s Village, Saturday, September 19 and Sunday, September 20, 10am-6pm both days with pumpkin painting, pumpkin pie eating contests, live music, and a scarecrow-making workshop (reservations recommended), Routes 202 and 263, Lahaska, Bucks County, PA. Free admission and parking. Vote for your favorite scarecrow in the Annual Scarecrow Competition and Display.Bring a picnic to Rockwood Park and enjoy a Faerie Fest, Sunday, September 20, 11am-4pm, along with crafts, outdoor games, a bubble blowing station, storytime and more, and with the opportunity to take pictures with the Fairy Queen, Tooth Fairy, Gnome and more. New this year: performances by the Wilmington Ballet Academy of the Dance and Delaware Arts Conservatory on the South Lawn, 4651 Washington Street Extension, Wilmington, DE.The Jenkintown Festival of the Arts takes place Sunday, September 20, 1pm-6pm, with over 65 juried artisans, food, beer tents, live music by the Eric Mintel Quartet, Deb Callahan Band and more, Greenwood Avenue, Jenkintown, PA. 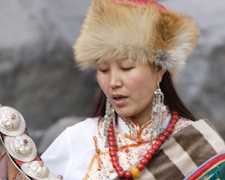 The Philadelphia premiere of the film Tibet in Song will be screened on Sunday, September 20, 2pm, showcasing traditional Tibetan music inside late-20th century Tibet while focusing a keen eye on cultural repression under Chinese occupation. Director Ngawang Choephel, who was imprisoned by Chinese authorities for recording songs and dances, will answer audience questions following the film, presented by the Philadelphia Folklore Project at the Painted Bride Art Center, 230 Vine Street, Old City, Philadelphia. Many of Philadelphia’s renowned and historic arts and culture organizations host special events to mark the inaugural visit of Pope Francis. Check out the Pope in Philly Entertainment Guide for more information.